If you dog has the curves, the seductive voice, and the blonde hair (and the cleavage), then you have got to get your dog the Marilyn Monroe Collection for dogs. There’s the Seven Year Dog Dress, Dogs Prefer Blondes Dress, and the Happy Birthday Mr. Fido dress and many more, so that your dog has many occasions to dress up and feel like a Hollywood superstar. 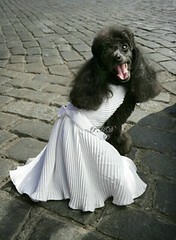 Now your dog can be a true diva. This entry was posted on Friday, May 18th, 2007 at 3:52 am	and is filed under Dogs, National Dog, Cat & Pet Info, Products & Services for Cats & Dogs. You can follow any responses to this entry through the RSS 2.0 feed. Both comments and pings are currently closed. Halloween is a long way off…….